Multiple 911 calls of shots fired at the college drew dozens of law-enforcement officers. Students and staff were evacuated; some hid for hours in classrooms or closets. The lockdown is over but classes are canceled and police still don't know what happened. 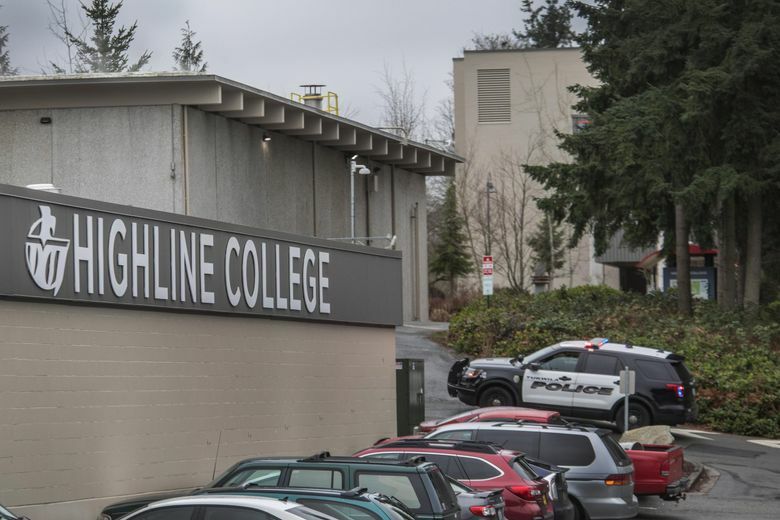 After a search of Highline College, police say there is no indication of a shooting on campus despite earlier reports and a massive police response. The report drew dozens of law-enforcement officers from agencies throughout the area to the college. They immediately searched the campus for signs of a shooting. No injuries were reported, but two students were treated for asthma-related conditions, police said. 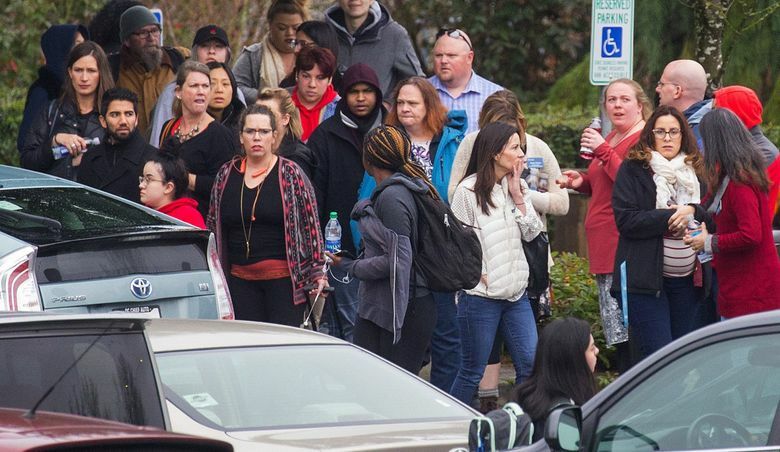 The campus, which hosts about 5,000 people on a typical weekday, was on lockdown for around two hours, as police went building to building searching for possible victims and a suspect. Ultimately they found none, and found no shell casings or any other evidence that shots had been fired. The rest of Friday’s classes were canceled. Police still do not know what happened to cause the alert and lockdown. Commander Doug Jenkins, of the Des Moines Police Department, said they would search the campus again, looking for shell casings, and contact everybody who called 911, to ask again what they saw and heard. The first 911 call, reporting sounds of eight gunshots, came in at 8:52 a.m., Padilla said. It was followed almost immediately by eight more 911 calls. Police were on the campus within three minutes. “We had multiple reports, most of them based on quite a bit of emotion from the incident in Florida, so we took it seriously,” said Chief George Delgado of the Des Moines Police Department, referring to the mass shooting Wednesday at Marjory Stoneman Douglas High School in Parkland, Fla., that killed 17 people. He said police dealt with conflicting information, both from 911 calls, from reports to campus security and through social media. 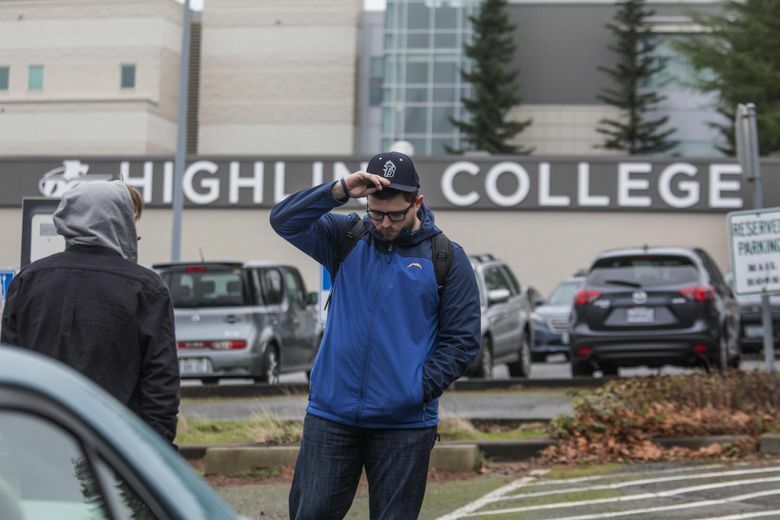 “We went on immediate lockdown, we have drilled for these types of events in the past,” said Jeff Wagnitz, interim president of Highline College. The tragedy in Florida was at the forefront of many students’ minds as they reacted to Friday morning’s events. 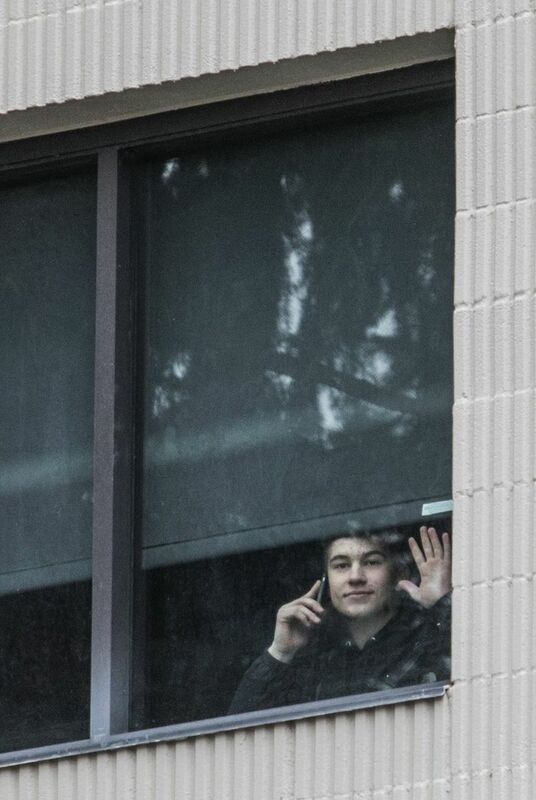 Giovan Cervantes, 16, was walking to class at around 8:50 a.m. when he heard what may or may not have been gunshots. 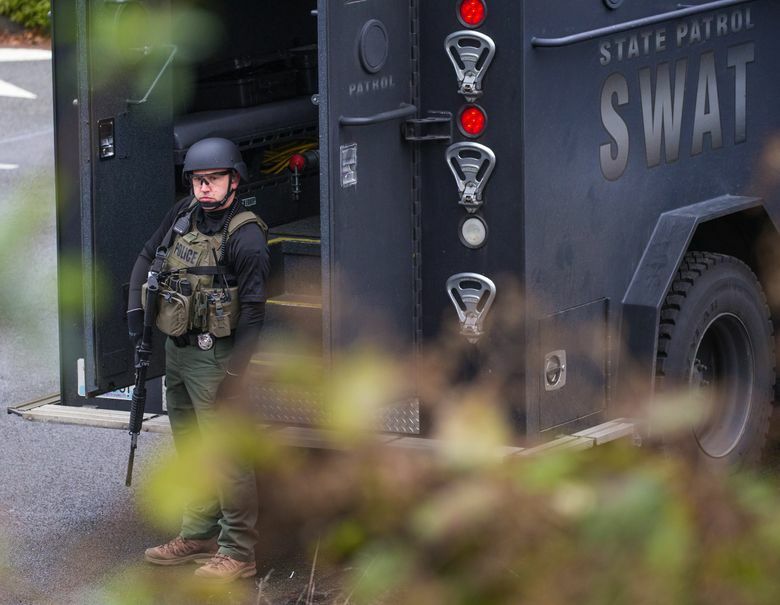 About a dozen law-enforcement and emergency agencies responded, including three SWAT teams, Padilla said. 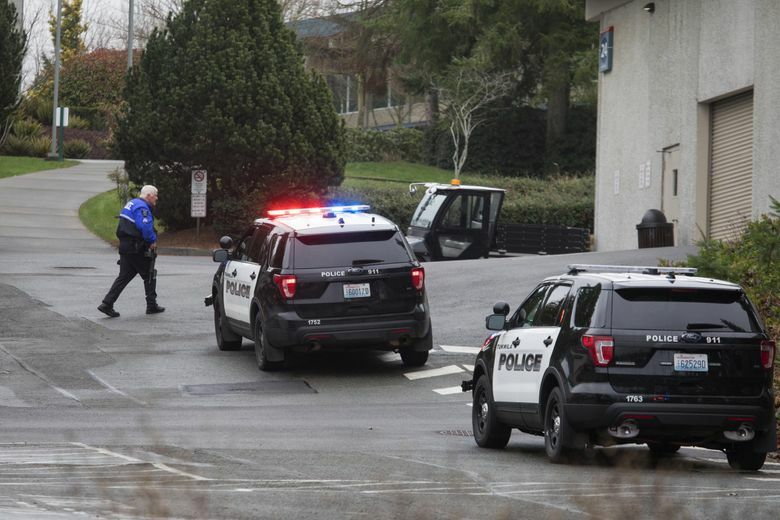 About 11 a.m., Puget Sound Fire tweeted there was no evidence of a shooter or victims, but authorities continued their search. Kierra Jenkins, 16, was locked in a classroom with 20 to 30 classmates. Their professor talked about the Florida shooting as he tried to prepare them for what could happen. They barricaded the door with desks and chairs. During the search, police found frightened people hiding in closets. Others were led by police from their classrooms. Cedrianna Brownell, 20, said she was in a closet with 23 classmates for more than two hours. They moved to the closet because their classroom door didn’t lock. It was very crowded and very hot, she said. 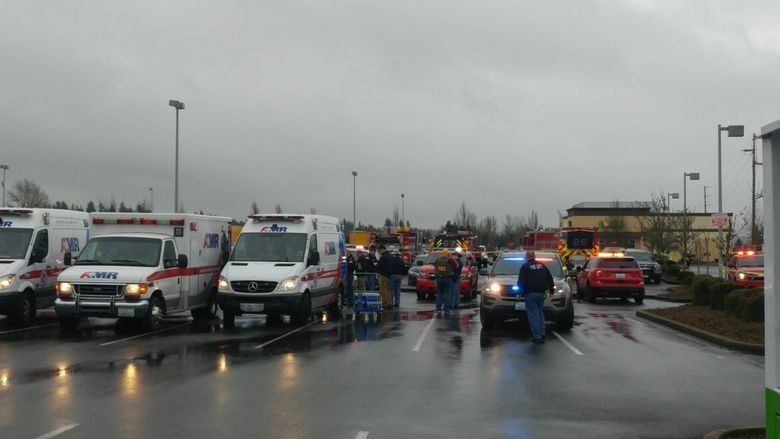 The Washington State Department of Transportation said all lanes of southbound Interstate 5 near Des Moines were closed due to a police incident, but the lanes were quickly reopened. Pacific Highway South was also closed for a time near the school. When a call was placed to the campus, it was initially answered with a recorded message that the school was on lockdown. 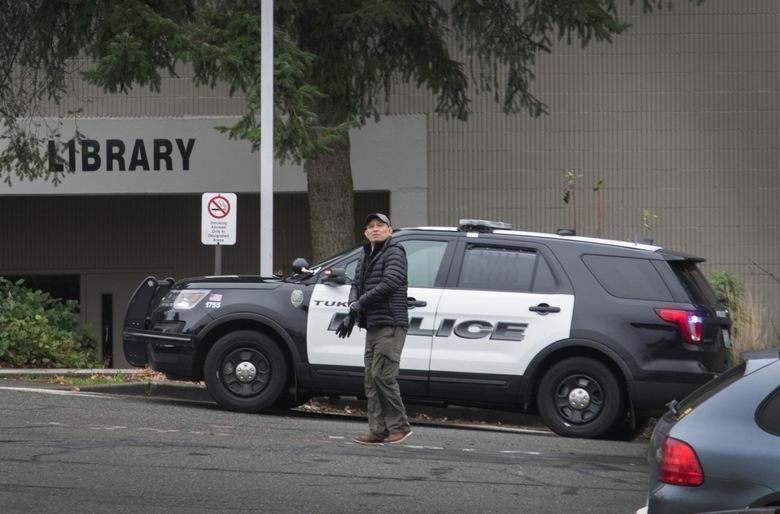 Eventually a person who identified herself as an operator confirmed the lockdown, said a shooting had been reported on the campus and said police were going through the college’s buildings one by one. “I hope I’m here to answer when you call back,” the operator said. “It’s like a war zone,” he said, adding that he had heard gunshots. He provided no more details before saying he had to go and hung up the phone. Carlos Quijada, 27, was among those who went to the college after hearing reports of a possible shooter. His wife is a Highline student and their 3-year-old daughter is in day care at the college. He said his wife had been in lockdown since 9 a.m.
“It really freaked me out. I panicked after what happened (Wednesday),” he said. 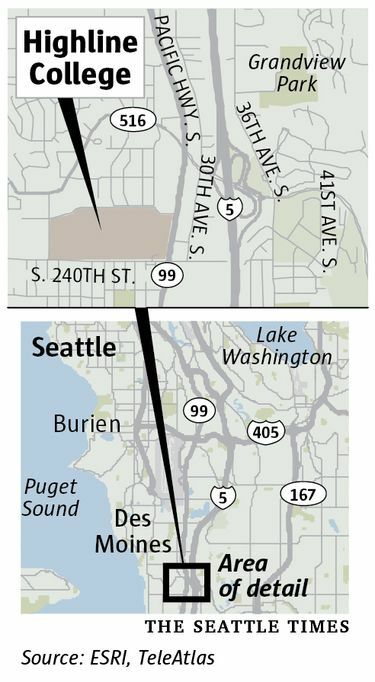 Seattle Times staff reporter Michelle Baruchman contributed to this report.